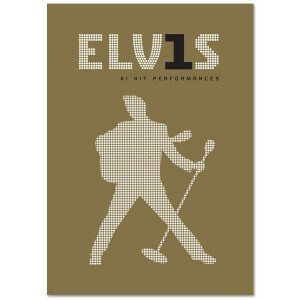 This collection of wonderful performances by the King of Rock 'n' Roll showcases 15 of his Number One Hits. Culled from his TV guest appearances, movies, concert films, and television specials from 1956 to the 1970s. Finally, a great DVD showing Elvis fans just what they want! What is that? Everything Elvis stood for in earning the title "The King". From the early years and on, the voice, his humor, the fantastic great looks, sensuality and just plain sexiness pops out at you with great video appeal. There are several on stage scenes I have never seen before and that is always exciting to see. I surely do recommend it, especially for those whom have yet to experience Elvis and want to know what all the fuss is about! This DVD will surely give them a little more than just a hint! Thank you Elvis, for leaving us with these wonderful performances! Great new Elvis DVD release! If you liked the 30 #1 Hits (a must have album!!! for every music fan) you will like this DVD. The greatest Elvis hits on DVD!!! I enjoyed it very much and still do! And with the Christmas ahead I know the perfect Christmas gift for my friends and family... Buy this one!